Banksy is the most famous street artist in the world at present – he is a household name in Britain and an inspiration to many artists. He’s a celebrity figure, with his work selling for huge sums of money, and there’s also something of a secondary Banksy industry completely separate to the artist himself (and, it has to be said, exploiting his fame): for example, Banksy birthday cards, Banksy T-Shirts, and prints of digital photos of his works are sold at dozens of shops and market stalls around London. His own publications (such as Wall and Piece) have sold in massive numbers and his website (here) has got to be one of the most visited street art sites on the net. He organised and funded the Cans Festivals (which I have written about in this blog already) – a massively generous gesture which put the work of street artists and graffiti artists from around the world on display in a disused tunnel in London. 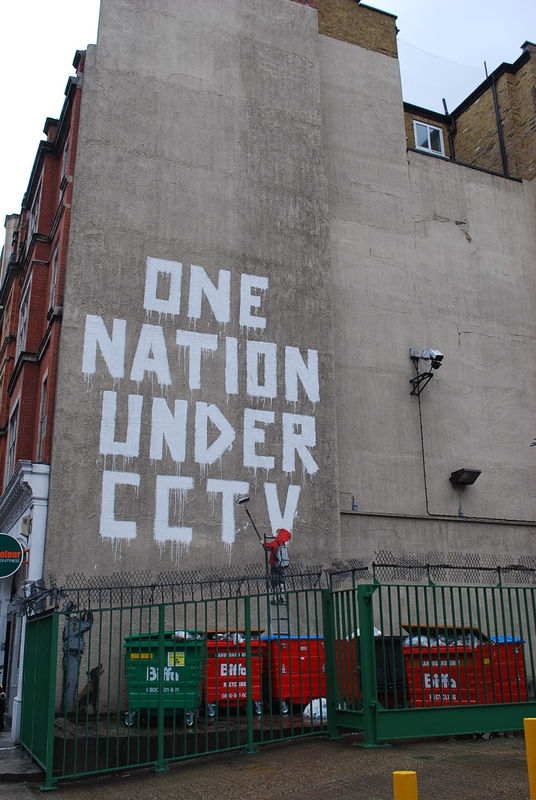 His own work is distinguished by some very recognizable characteristics and motifs – rats, the balloon girl, the Tesco supermarket bag, a certain mockery of the police (for example, his ‘snorting copper’, hoovering up a massive line of cocaine as he kneels on the ground) and a facility for snappy slogans (for example, ‘One Nation Under CCTV’). And just when you might have been thinking that his work had settled into a format so recognizable that it might almost be in danger of becoming a brand, Banksy has managed to surprise everyone again, by staging what is simultaneously an artwork, an installataion and an event, in New York City. The Banksy Village Pet Store & Charcoal Grill is situated in a former shopfront, displaying in cages what looks at first glance like animals, as you would expect in any pet shop. Closer inspection reveals mutant creatures, fast food items behaving like animals, and animals in contexts designed to provoke discomfort in the spectator about the uses we make of animals, such as testing cosmetics upon animals such as rabbits, or turning animals into hot dogs and burgers (the very title of the work shows Banksy’s interest in interrogating the link between a pet store, which is about our desire to domesticate animals as our pets, and a restaurant, which is about our desire to flame-grill them on hot coals and eat the result). Many people have responded to this work with delight, but also with surprise, as if it’s a huge departure for Banksy. And in some ways it is – it’s a long way from a stencil on a wall to a moving hot dog in a display case. But it’s also worth recalling Banksy’s painted, living elephant, displayed in Los Angeles – an artwork constructed to undercut the well-worn phrase, ‘the elephant in the room’ (check it out here). That piece showed Banksy’s interest in the moving image (not cinema, but the image that literally moves). And perhaps since that work attracted some criticism (people asked if it was cruel to paint the elephant), in Banksy’s Village Pet Store & Charcoal Grill the creatures are animatronic creations, and far more uncanny as a result. For those of you lucky enough to be in or near New York City, you can see these creatures ‘in the flesh’, as it were. Those of us elsewhere will have to make do with watching the many videos uploaded onto YouTube. Enjoy! i am excited to see the banksy pet store… have it on my “to do” list for this coming week. also, i FINALLY added a link to your blog from my blog. it’s sad how long it takes me to act sometimes.